Shortly before the birth of Christ, Roman legionaries founded the central site of the Ubii, the oppidum Ubiorum, in the historic centre of Cologne. The population of the new settlement grew rapidly, trade and crafts flourished. In the year 50 AD, at the request of his locally born wife Agrippina, the Roman Emperor Claudius conferred on the city the status of a colony according to Roman law and gave it the name Colonia Claudia Ara Agrippinensium (CCAA).The city featured monumental stone buildings, temples, the palace of the proconsul and baths; paved streets with underground channels and an aqueduct were part of the sophisticated infrastructure. Mighty city walls with gates and towers served both to protect and adorn the city. The Romano-Germanic Museum presents the archaeological heritage of the city and the surrounding area from the Palaeolithic period to the early Middle Ages. Built in 1974 in the centre of Cologne and in the immediate vicinity of Cologne Cathedral, it has so far welcomed more than 20 million visitors. The museum stands on the foundations of an urban Roma villa with the world-famous Dionysius mosaic. Like the monumental tomb of the veteran legionary Poblicius it can be admired from the cathedral square through a panorama window before the visitor enters the museum. Among the oldest finds are the one hundred thousand year-old stone tools from the Kartstein cave in the Eifel. Finds from the Neolithic settlement of Cologne-Lindenthal, in which the earliest arable farmers of the Rhineland lived, are internationally well-known. Decorated architectural elements, stone inscriptions, portraits, wallpaintings, mosaics and exquisite tableware reflect life and luxury in Roman Cologne. 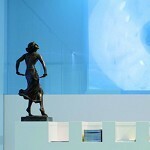 The museum has the worldwide biggest collection of Roman glass vessels. Among the most precious objects are the rich goldsmith works from the Diergardt Collection, relics of Germanic and equestrian nomad peoples from all over Europe. Precious burial goods from graves of the 5th to 7th centuries provide evidence of the lives of Romani and Franks in early medieval Cologne. 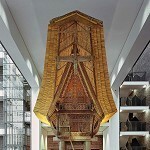 Das Römisch-Germanische Museum zieht um! 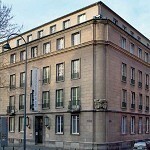 Das Haus am Roncalliplatz ist geschlossen für eine Generalsanierung! Bedeutende Funde zur Stadtgeschichte ziehen um und werden ab Juni 2019 im Belgischen Haus (Cäcilienstaße 46, Nähe Neumarkt) zu sehen sein. Der Eröffnungstermin wird rechtzeitig bekannt gegeben. Dionysos-Mosaik und Poblicius-Grabmal können im Rahmen von Führungen weiterhin besichtigt werden! cellar of a private house. ecclesiastical building. The remains date from the Roman period until the High Middle Ages. You can admire the precious finds – above all grave goods from the 6th century – in the Cathedral Treasury. This world beneath the cathedral has been given a completely new layout in the past few years and large areas are accessible to the public for the first time. There may be delays due to the high level of demand. 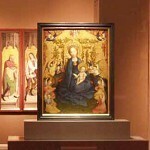 Visits are only possible within the framework of a guided tour, daily except for Tue and Thu at 3 pm. Meeting point: ticket desk for access to the spires. This is considered the best-preserved underground burial chamber north of the Alps. Built and equipped by a wealthy family in the 2nd century, it provides a unique insight into the luxury of Roman graves and burial rites. 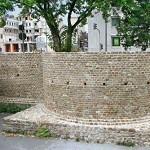 A few sections of the Roman city walls, which were almost four kilometres in length, have been preserved within the present-day city. The central arch of the North Gate with CCAA, the name of the city, is to be seen in the Romano-Germanic Museum; a side entrance of the mighty gate structure has been re-erected in front of the cathedral. The impressive Roman Tower (Römerturm) with its richly decorated masonry is within walking distance. Cologne-Boulogne sur Mer (via Belgica) and Cologne-Lyon (via Agrippa). Both roads – examples of excellent Roman engineering – are recognisable in the modern city and still profoundly influence the cultural landscape. Within the framework of the EU project “Erlebnisraum Römerstraße” 18 municipal partners, among them Cologne, present the two arterial roads both in the past and present. 120 information boards mark the route and point to attractive destinations in the vicinity. 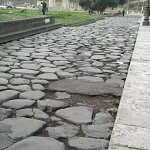 Discover landscape and culture to the left and right of the Roman roads on foot or by bicycle. Taking children along the city walls. No problem – a new brochure for young people makes things easy. 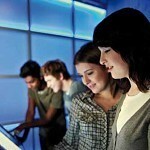 It enables you to take an interactive archaeological walk past the remains of the city’s fortifications. The publication is for sale at the starting point of the tour in The Romano-Germanic Museum (for children from 9 years of age, 5,00 €). 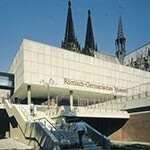 Programme Suggestion "Cologne and the Romans"
has been preserved to a height of several meters, is overwhelming. At the present time the area in front of the Historic Town Hall is still being excavated. The view of the walls, floors and cellars is at first confusing but soon becomes clear thanks to the informed explanations of the museum guide. In the early and High Middle Ages the Jewish population lived in the centre of the city; here you see the foundations of the synagogue and several private houses. You can even climb down into the Mikvah, the ritual baths. After these excursions why not stroll into the nearby ‘Altstadt’ – a cool “Kölsch” – local beer – awaits you in the breweries. modern Cologne? Then first go down into the newly created entrance area of the south spire of the cathedral. Before you climb the 533 steps, walk through the foundations of the spire into the excavation area beneath the cathedral. 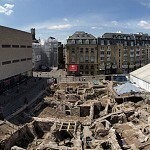 Foundations of earlier buildings and graves were discovered here – reaching back to Roman times. Of course, you will also be visiting the cathedral itself. It is one of the biggest Gothic cathedrals worldwide. It was begun in the 13th century but only completed after a long interruption of building activities in the 19th century. The third largest church in the world has been listed as a world heritage site since 1996 by UNESCO. Many Romanesque churches have a Roman past. 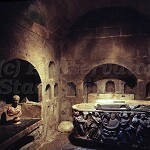 In the crypt of Groß St Martin in the Old Town you will find Roman foundations. St Severin in the Südstadt is built on a Roman cemetery; there are numerous Roman sarcophagi, Frankish stone grave slabs and the foundations of a memorial construction. St Gereon goes back to a late Roman building. In the Frankish Kingdom it was famous as the church of the Golden Saints and the burial place of the Frankish aristocracy.